causes the creation and existence of beings is called karma. The absolute (Brahman) is imperishable, supreme, infinite and beyond all these descriptive attributes. Any description limits it. Thus our Master used to say: "To define Brahman is to deny Brahman". Hence it was that Buddha refrained from discussing it, and that Dakṣiṇāmūrti conveyed the wordless knowledge of it to the Sanatkumārā, by silence filled with transcendental knowledge. Brahman is not an inert nothingness or a void. The supreme or totality does not undergo any change or decay. Yet, in it there is constant change, which implies constancy and change. These are not contradictory but complementary. 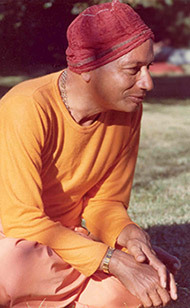 The nature inherent in this totality is adhyātma. Or, con­versely, ātma, or selfhood, is inherent in this totality even to the point of individuality. That is, you do not belong to yourself; yourself belongs to the totality. This totality has, as its very substratum, infinite diversity which is the self of all; just as the night sky is studded with millions of diamonds - the stars. Thus, self-knowledge is a re-attainment of something which the personality has lost. When the personality is keenly analysed, it becomes transparent, revealing its own substratum - that cosmic conscious­ness which is the goal, the supreme fulfilment or self-knowledge. The compound word ‘bhūtabhāvodbhavakaro' suggests a dream or vision of something as if it existed. That is the karma of the totality or God. Hence, God does not ‘create' as the carpenter creates furniture, but in that cosmic being there arises a feeling (bhāvanā) of the manifestation (bhūta) of all this multidiversity. That is called the universe which is maintained by God's grace, so that the souls therein may gain the necessary experience to attain self-knowledge. Understood in this light, even the law of karma is seen as a contributory factor towards evolution and attainment of self-knowledge.